Original designs can be a lot of fun to develop. When I have an idea I usually do a few drawings on paper to see if my concept design is worth persuing. If I like what I see I continue developing the design before I even touch fabric. This skull design started with several skull templates of varying shapes. I like to cut them out so I can see how they look free standing outside of the contrains of an A4 sheet of paper (right). Once I have my shape and design I develop it further through the computer (center). The computer stage allows me to straighten the design, mirror elements and make everything more uniform. I always work from the computer design which will go into the final pattern if the mockup is successful. 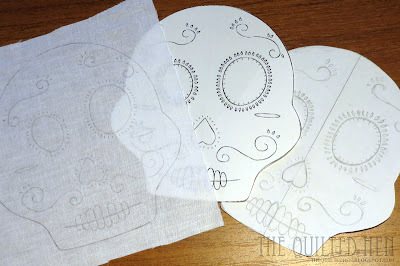 On the left is the transfer onto fabric ready to begin the embroidery component of this design. As the construction stage begins you need to be prepared to trash your progress and go back to the start to re-develop the design if issues arise. It is good to take time with initial drawings and think about how you will be constructing your project and what you need to take into account before you begin. So now... we'll see if this one leads to a finished project.